Posted by admin in activity reports, Costa Rica, eruptions, Poás, Turrialba. In volcanically active Costa Rica two volcanoes chose to erupt simultaneously yesterday, says the English-language news site Inside Costa Rica: both Turrialba and Poás erupted what journalists insist on calling ‘smoke’ early on the morning of Tuesday 14 September. As the two volcanoes are 55 kilometres apart the effect of simultaneity will have been lost on anyone actually present at either of them. The eruptions do not seem to have been particularly significant: experts from OVSICORI regard the activity as normal, with clear skies and lack of wind making the volcanoes’ habitual emissions more visible than usual. OVSICORI volcanologists will be visiting the volcanoes to evaluate the effects of the activity. Posted by admin in activity reports, Bagana, Batu Tara, Caribbean, Costa Rica, Dukono, El Salvador, eruptions, Fuego, Guatemala, Hawaii, Indonesia, Kamchatka, Karymsky, Kilauea, Kliuchevskoi, Manam, Papua New Guinea, Russia, San Miguel, Shiveluch, Soufrière Hills, Turrialba, Ulawun, United States, Weekly Volcanic Activity Reports. The Smithsonian Institution/United States Geological Survey Weekly Volcanic Activity Report for 11-17 August 2010 is now available on the Global Volcanism Program website. The following is a summary and not a substitute for the full report. New activity/unrest: Kilauea (Hawaii, USA), Manam (Papua New Guinea), San Miguel (El Salvador). 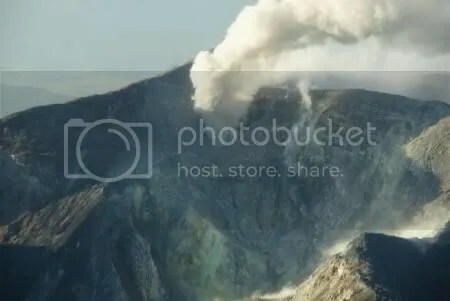 Ongoing activity: Bagana (Papua New Guinea), Batu Tara (Indonesia), Dukono (Indonesia), Fuego (Guatemala), Karymsky (Russia), Kliuchevskoi (Russia), Shiveluch (Russia), Soufrière Hills (Montserrat), Turrialba (Costa Rica), Ulawun (Papua New Guinea). Posted by admin in Costa Rica, Turrialba, volcano monitoring. A sharp-eyed Costa Rican has spotted a UFO caught by the OVSICORI webcam recently installed at the summit of Turrialba, reports La Prensa Libre. The sighting happened on 27 January and has been verified by ‘an expert on UFOs’ (so that’s alright then). Aliens have visited Costa Rica’s volcanoes before: here they are buzzing Arenal in 2007. Posted by admin in activity reports, Costa Rica, Turrialba. Turrialba, which erupted on a small scale at the beginning of January, has returned to a state of ‘passive degassing’ similar to that which pertained before the eruption, according to reports from Costa Rica. However, Ovsicori experts have warned that although activity has declined low intensity earthquakes continue, the volcano remains active and people should not be complacent. The Comisión Nacional de Emergencias (CNE) has revised the alert levels currently applied to the area surrounding the volcano, with Yellow Alert now applying to a 2 km radius zone around the volcano and Green Alert to areas beyond that limit (CNE news release: Alerta Verde y Alerta Amarilla ante Actividad Volcánica). For the volcanologists of the National Seismological Network and Ovsicori, that figure was much too ‘high’, because normally helium at the volcano fluctuates between 2 and 8 ppm. ‘That would be way too much’, says Raúl Mora, volcanologist at the [National Seismological] Network. The volcanologists and Díaz apparently got into a discussion lasting several hours about this at the CNE headquarters yesterday, according to La Nación. However, the presence of high proportions of helium in gas emissions from Turrialba was noted back in April 2008, when it was interpreted as being the result of magma build-up within the volcano. Measurements taken in March 2008, also by Díaz, indicated helium levels of 80 ppm. At that time, Ovsicori reported the normal level of helium for Turrialba as 25 ppm, which would make a possible level of 30 ppm now a bit less of a leap (an earlier report in the Tico Times has Díaz reporting levels of 20 ppm). In any case, the presence of elevated helium levels in Turrialba’s emissions is an indicator that fresh magma is being intruded into the volcanic system. For all our coverage of Turrialba: Turrialba « The Volcanism Blog. Posted by admin in activity reports, Costa Rica, NASA Earth Observatory, Turrialba, volcanoes. The image above, from the NASA Earth Observatory, shows ongoing activity at Turrialba volcano, Costa Rica, captured by the Advanced Land Imager (ALI) aboard NASA’s Earth Observing-1 (EO-1) satellite on 21 January 2010. The damage caused to vegetation to the west of the volcano’s summit by acidic gas emissions is clearly visible. Hazy grey-blue fumes can be seen drifting north from the active summit crater, which is the westernmost of Turrialba’s three craters. The current cycle of activity at Turrialba began in 2007 with an increase in fumarolic emissions and the opening of cracks in the summit area. Turrialba’s gas emissions caused severe problems for local agricultural communities during 2008 and 2009 because of acid burning of vegetation: crops have been damaged, and pasture for livestock has also been affected. On 5 January 2010 there was a small eruption, the first since 1866. Gas emissions fell in the aftermath of the eruption, but have increased again subsequently. View of Turrialba volcano from the NE, showing the plume being produced from the new cavity opened by the recent activity. Photograph taken by E. Duarte on 20 January 2010 (OVSICORI-UNA). On 20 January 2010 an overflight of Turrialba took place (OVSICORI report PDF here) which reported a ‘revitalization of the column of gas and steam with suspended particles’. The photograph above was taken during this overflight. A sustained emission was reported on that day, with a thick, dark plume from the summit moving WNW, the strong wind preventing the plume from rising much above the altitude of the volcano. Some light ashfall was reported in areas near the volcano. ‘Although the transport and distribution of volcanic particles (old ash) is a new occurrence for this eruptive period of Turrialba volcano’, notes the report, ‘the minimal quantity carried this morning could be the first of much more in the near future’ as material eroded from the internal walls of the active conduit is carried up into the plume. Posted by admin in Costa Rica, Turrialba. Still with Turrialba, the NASA Earth Observatory has just published a great new image of the volcano, showing emissions from the summit and the damage that gas emissions have been doing to downwind vegetation. We’ll be posting more about this image, and about Turrialba generally, later today. Posted by admin in activity reports, Africa, Arenal, Caribbean, Chaitén, Chile, Congo (Dem. Rep.), Costa Rica, Ecuador, eruptions, Gaua, Hawaii, Japan, Kamchatka, Karymsky, Kharimkotan, Kilauea, Kliuchevskoi, Nyamuragira, Papua New Guinea, Planchón-Peteroa, Rabaul, Russia, Sakura-jima, Sangay, Shiveluch, Soufrière Hills, Suwanose-jima, Tungurahua, Turrialba, United States, Vanuatu, Weekly Volcanic Activity Reports. 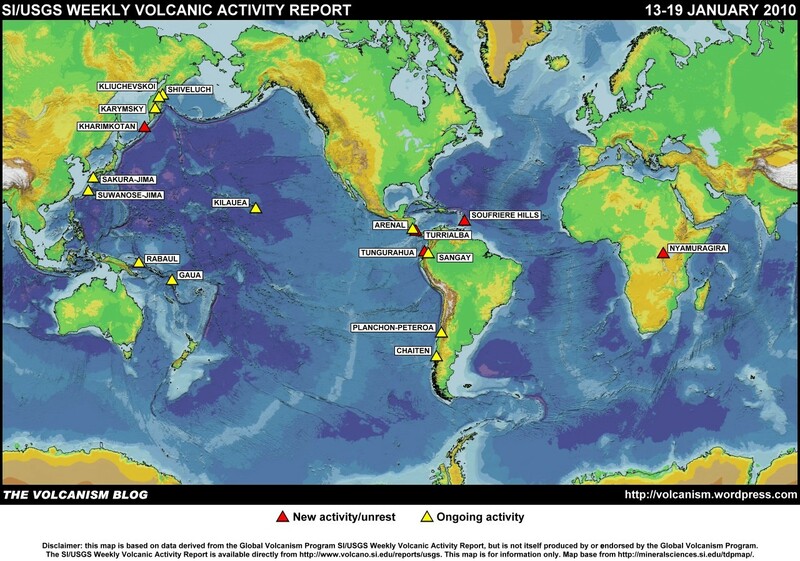 The Smithsonian Institution/United States Geological Survey Weekly Volcanic Activity Report for 13-19 January 2010 is available on the Global Volcanism Program website. The following is a summary and not a substitute for the full report. New activity/unrest: Kharimkotan (Russia), Nyamuragira (Democratic Republic of Congo), Soufrière Hills (Montserrat), Tungurahua (Ecuador), Turrialba (Costa Rica). Ongoing activity: Arenal (Costa Rica), Chaitén (Chile), Gaua (Vanuatu), Karymsky (Russia), Kilauea (Hawaii, USA), Kliuchevskoi (Russia), Planchón-Peteroa (Chile), Rabaul (Papua New Guinea), Sakura-jima (Japan), Sangay (Ecuador), Shiveluch (Russia), Suwanose-jima (Japan). Posted by admin in activity reports, Africa, Alaska, Barren Island, Caribbean, Chaitén, Chile, Congo (Dem. Rep.), Costa Rica, Ecuador, eruptions, Fuego, Guatemala, Hawaii, India, Indian Ocean, Japan, Kamchatka, Karymsky, Kilauea, Kliuchevskoi, Mayon, Mexico, Nyamuragira, Pacaya, Papua New Guinea, Philippines, Piton de la Fournaise, Popocatépetl, Rabaul, Redoubt, Russia, Sakura-jima, Santa María, Shiveluch, Soufrière Hills, Suwanose-jima, Tungurahua, Turrialba, United States, Weekly Volcanic Activity Reports. The Smithsonian Institution/United States Geological Survey Weekly Volcanic Activity Report for 6-12 January 2010 is available on the Global Volcanism Program website. The following is a summary and not a substitute for the full report. 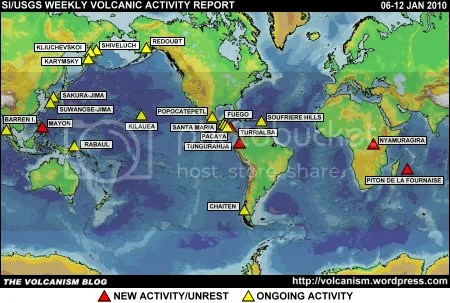 New activity/unrest: Mayon (Philippines), Nyamuragira (Democratic Republic of Congo), Piton de la Fournaise (Réunion), Tungurahua (Ecuador), Turrialba (Costa Rica). 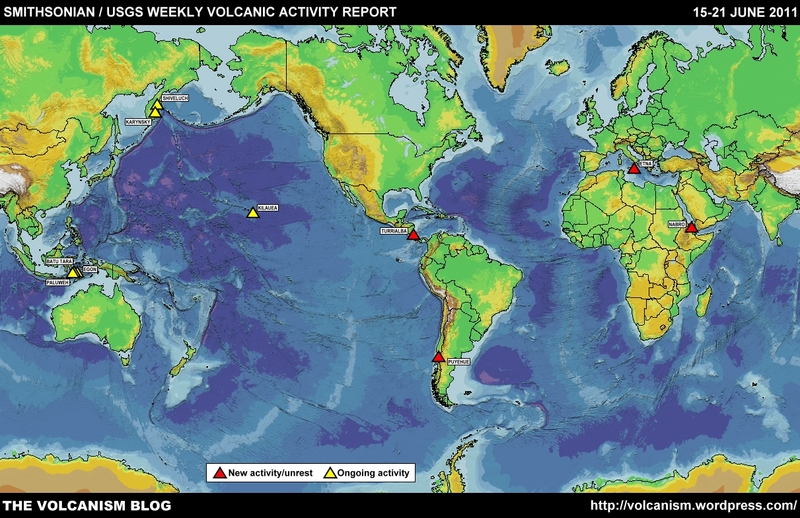 Ongoing activity: Barren Island (India), Chaitén (Chile), Fuego (Guatemala), Karymsky (Russia), Kilauea (Hawaii, USA), Kliuchevskoi (Russia), Pacaya (Guatemala), Popocatépetl (Mexico), Rabaul (Papua New Guinea), Redoubt (Alaska, USA), Sakura-jima (Japan), Santa María (Guatemala), Shiveluch (Russia), Soufrière Hills (Montserrat), Suwanose-jima (Japan). Posted by admin in activity reports, Costa Rica, eruptions, Turrialba. Around 14:00 on 5 January 2010 ashfall originating from the western crater of Turrialba volcano was reported in several localities around the volcano (La Central, La Pastora, La Esperanza, among others) and in more distant locations such as the Irazú Volcano National Park, Aguacaliente de Cartago, Tres Ríos, Curridabat and Desamparados. This eruption, which is another manifestation of the degassing of the volcano, consitutes the first eruption of ash from Turrialba in many decades. On 4 January at 10:57 (local time) there was a phreatic explosion (caused by the decompression of steam at high temperatures) of a large scale at the volcano (greater than those occurring during 2009) followed by another three explosions of lesser magnitude at an interval of 10 minutes. These explosions were produced by the opening of ducts for the escape of pressurized gas. The explosions were followed by a tremor of large amplitude that was maintained for more than 45 minutes. The tremors resulted from the movement of fluids through restricted ducts, in this case associated with the expulsion of gas and ash or fine particles swept along by the expelled gas. The tremor persisted but its amplitude decreased towards 15:20 as several smaller explosions took place followed by almost continuous tremor, sometimes spasmodic, reaching large amplitudes at 23:30 on 4 January and 10:45 on 5 January. From 15:30 on 5 January the tremor is recorded continuously and at low amplitudes. This low-amplitude tremor continued until 16:58 on 8 January; since that time the tremor has ended and the volcano has returned to the same LP type earthquakes that were recorded before 4 January, ‘so it is possible to be sure that activity at the volcano has returned to the levels of before the phreatic eruption’. Ovsicori scientists carried out a field visit on 6 January to assess ashfall and collect ash samples. They found ‘a very thin layer of ash’, not uniform in distribution, across and area between 8 km and 15 km WSW of the volcano. Analysis of the ash revealed that ‘the ashes erupted by Turrialba volcano between 5 and 6 January are almost [pH] neutral, i.e. of a nature between very slightly acidic (mildly corrosive) and very slightly alkaline (mildly caustic)’. The low acidity of the lava ‘suggests that so far there has been no involvement of lava in the ash eruptions or additional inputs of new magmatic gases’. The eruptive activity that began on 5 January represents a process at a superficial level in the volcano, consisting of the rapid heating and vaporization of a body of subterranean water followed by sudden decompression through the fracture system of Turrialba. The discharge of steam and gases through the fumaroles on this occasion has had much more vigorous results than those observed in previous years. The heat source is provided by the intrusion of a magmatic body at depth … The absence of juvenile magmatic material in the recently erupted ash and its pH indicate that the groundwater has not come into contact with the magma intruded at depth but has been mainly heated by the conduction of heat through the rocks within the volcano. In summary, at present there are no characteristic signs indicating the presence of magma at shallow levels in the volcano, so the occurrence of an eruption of magmatic nature in the near future (the next few days or weeks) can be ruled out. However, it is not possible to rule out the occurrence of new phreatic events (similar to those seen in recent days).